The latest in the divisive conflict raging inside the Davao del Norte Electric Cooperative (Daneco) is that a group is now waving a white flag with a big “if” emblazoned on it. The group of officials of Daneco who have taken control of the Daneco’s Tagum office have promised to resign come the Oct. 21 special general they had earlier called for. In a press conference last Tuesday held at Daneco Tagum office at Tipaz, Barangay East, Tagum City, board director Engr. Abiner Labja and “Daneco-CDA” OIC general manager Reynaldo Bandala both echoed their group’s position of resigning but on the condition that the Daneco member-consumers would accede to it. The group controlling what they called as “Daneco-CDA” in their aggressive bid to put Daneco under the Cooperative Development Authority (CDA) and bolt from the control and supervision of the National Electrification Administration (NEA) has recently faced a problem that might empty them of legality to further hold on when the CDA itself suspended Daneco’s CDA registration pending resolution of a case filed before the Court of Appeals (CA). 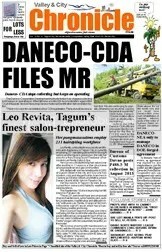 Since July the “Daneco-CDA” group has been holding on Daneco Tagum office and its entire management over Tagum office’s area of jurisdiction in Davao del Norte including the collection of power bill payments, leaving the Compostela Valley area under the management of “Daneco-NEA” based at the main office in Montevista, Compostela Valley. NEA designated an employee Benedicto Ongking as the OIC GM to work side by side with the NEA Project Supervisor Evangelito Estaca. But later most of Daneco Tagum office’s regular employees deserted their pro-CDA management, went to “Daneco-NEA” side and started collecting payments for power bills using the hot open areas of power substations in the city as their temporary offices. Before they left they downed the server of computers in the office and carted away the computer program containing the vast records of member-consumers. Since then Tagum City has become an arena in the tug-of-war of collection activities of two contesting “Daneco-CDA” and “Daneco-NEA” groups or managements, creating confusions to among member-consumers in the Tagum and Davao del Norte areas as two different electric bills come arriving in energized households. In an order dated September 28, CDA chairman Emmanuel Santiaguel ordered for the suspension of Daneco’s CDA Certification of Registration No. 9520-11021778, issued on May 21, 2012. But in last Tuesday’s press conference, the group called on Santiaguel to recall his suspension order and stand for the conversion of Daneco into stock cooperative, which they claimed to have already been realized when member-consumers voted an “overwhelming” 49,056 yes votes in favor to CDA as against the 1,773 votes for NEA in a series of referendum held last May. A large majority of Daneco’s employees however, went against the CDA, as they preferred NEA to continue supervising the 41-year old electric cooperative. They claimed that the referenda were sham and were rushed to save the board and management officials who were subject of dismissal by NEA due to an administrative case they were facing. Daneco has over 125,000 member-consumers and is considered to be the biggest business in the provinces of Davao del Norte and Compostela Valley, its franchise area, less the towns of Carmen, Sto. Tomas and BE Dujali and Panabo City in Davao del Norte, which are catered by the Aboitiz-owned Davao Light and Power Corporation. 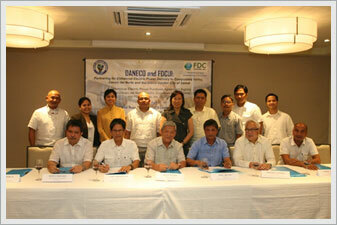 In 2011 Daneco generated a total revenue of P1.8 billion. Also, Atty. Glenn Blair Carnicer, legal counsel of the “Daneco-CDA” group, assailed Santiaguel’s action as violative to Section 67 of Republic Act No. 9520, otherwise known as Cooperative Code of the Philippines, saying that the order was bereft of CDA board resolution. But the “Daneco-CDA” group for all their aggressive legal recourses, legal-procedural filibustering to court orders and open defiance to be booted from their posts since April had managed to foil last Oct. 3 the attempt of a sheriff backed up by a group of provincial policemen in full battle gear to implement a WPI (writ of preliminary injunction) from the Court of Appeals for the group to give way and turnover the management of Daneco Tagum City office. On that day, sheriff Renato Suarez of the Regional Trial Court Branch 3 in Nabunturan, Compostela Valley arrived at the vicinity of Daneco Tagum office and served the order to Bandala. Reports said that prior the serving, the sheriff, accompanied by policemen led by Davao del Norte provincial police director PSSupt. Edgardo Wycoco and armed security guards from the Security Agency and Guard Supervision Section, disarmed the security guards from Christian Investigative and Security Agency (CISA) manning the office and drove out customers. A group of Daneco employees were also reportedly lurking around to support the supposed takeover via a sheriff’s order. But the “Daneco-CDA” group resisted, stood their ground and particularly Atty. Carnicer, fuming mad, ordered office employees to physically bar the sheriff and his group, reports added. They insisted the sheriff carried no order for takeover but only the ouster of Bandala. After that, the group cried harassment and vowed to file a case against the sheriff and his company. Suarez group reportedly backed out to avoid violence from breaking out due to heated atmosphere. Bandala insisted however that the sheriff carried an order that had no signatures of associate justices. Bandala said Tuesday that while the WPI is not yet around he would continue serving as the OIC GM. In October 2011, a group of seven member-consumers lodged an administrative complaint to NEA containing some 11 allegations involving anomalous biddings and disbursements, overpricing in the purchase of substation, unauthorized claims, questionable policy decisions, defiance to NEA’s regulatory powers, among others. The complainant-member consumers who lodged the case docketed as NEA ADM Case No. 01-10-11 were Gregorio Ybanez, Khernie Bahan, Epifanio Alfeche, Paulito Villaceran, Jr., George Monares, Juan Esperanza and Arnold Dinopol. Respondents were board president Dean Briz, board treasurer Ananias Darjan Jr, and director-members Brendo Ceniza, Miguel Fermil, Roberto Binasbas, Eugenio Ramonida, Roman Calicdan, Roberto Alam, and Engr. Dan Gervacio, and the two former OIC GMs Nelson Balangan and Felix Hibionada. Directors Alam and Gervacio later swore as pro-NEA and dissociated from the group although both had to be dismissed the same. On April 30, 2012 the NEA’s five -man Board of Administrators chaired by Dept. of Energy Secretary Jose Rene Almendras dismissed all the 9 respondent directors and former OIC GM Hibionada after they were found guilty of grave misconduct and gross neglect of duty. The dismissal carries the other penalties such as cancellation of eligibility to run for the position of electric cooperative director, forfeiture of retirement benefits and perpetual disqualification for re-employment in any rural EC. NEA only suspended Balangan for 30 days after he was found guilty of simple neglect of duty. The termination came a few days before the scheduled referendum on May 5 and 6, May 12 and 13 and May 19 and 20, which the group pursued contrary to NEA’s order to hold the referendum in abeyance. Despite the dismissal order of NEA, the terminated officials belonging to “Daneco-CDA” group refused to vacate from their posts. They banked on the assertion that they were still on motion for the reconsideration even as they demanded for a formal hearing on their case in a court. They cried injustice claiming that under their watch Daneco has become financially and operationally stable compared to the previous two managements. The Daneco Board submitted a motion to conduct a formal hearing on the case against them since there only two hearings held- a mandatory hearing which was held on January 26, 2012 and a Clarificatory Hearing held on March 12, 2012. However, even before a resolution was reached, the NEA Board of Administrators issued a memorandum on March 20, 2012 stating that the case is deemed submitted for resolution. Despite appeals from Daneco Board, they were terminated on May 2, 2012, three days prior to the scheduled referendum. The holding-out group is not without political backing. Compostela Valley Governor Arturo Uy and Tagum City Mayor Rey Uy did not hide their support for the conversion of Daneco into stock cooperative and to the pro-CDA group. Besides, the “Daneco-CDA” management found support from some partylist representatives such as Rep. Cresente C. Paez of COOP-NATCCO and Rep. Nicanor M. Briones of the AGAP Partylist, who made privilege speech regarding Daneco’s situation in Congress. 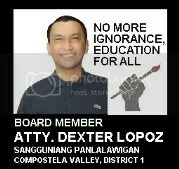 Both assailed the interference, bias, partiality, and manipulation of NEA to Daneco. Supporting partylist representatives talked about how NEA moves in not giving up electric cooperatives so easily to become real cooperatives like eating peanuts as against the EPIRA law, and on how NEA has been making ECs in the country as their milking cows. Davao del Norte Governor Rodolfo del Rosario, on the other hand, seems to be ambivalent and neutral to the Daneco issue until at press time. The dismissed officials then applied for a 72-hour temporary restraining order before RTC Branch 3 in Nabunturan, Compostela Valley. On May 3, the court granted the TRO on the NEA decision. Because of the supposed termination of the members of the board, NEA Administrator Editha Bueno issued a memorandum to Daneco on May 4, 2012, in the afternoon instructing the deferment of the scheduled referendum. It was defied by the group. The first round of referendum on May 5 for the towns of Maco, Mabini, Pantukan, Maragusan and Mawab in Compostela Valley did not materialize as Daneco employees tasked to supervise the referendum did not show up. The “Daneco-CDA” group cried sabotage. However, other referendum proceeded as scheduled as the group excluded the opposing employees from the tasks. Towards midway there was a TRO from an RTC in Tagum City issued to stop the referendum but just the same it was defied by the “Daneco-CDA” group. In late July RTC Branch 3 Executive Judge Hilaron Clapis Jr after extending twice the original 72-hour TRO to 30 days then 20 days, further issued an injunction against the NEA for its order of termination rendered against the members of the board. This prompted a complainant group to file a motion requesting the CA to issue a TRO against the order of the RTC Branch 3 and later applied for an issuance of a writ of preliminary injunction. On June 30, Saturday, armed with TRO from CA, the “Daneco-NEA” group led by NEA Deputy Administrator Ed Piamonte, Estaca and pro-NEA Daneco directors Rodolfo Ang, Gervacio and Rolando Bugas, former Daneco OIC GM Allan Laniba and complainant Gregorio Ybañez, their legal counsels and opposing Daneco employees tried but failed to make a takeover of Daneco Tagum office. It was the eve of the special general assembly called by the “Daneco-CDA” group on Sunday at Maco gym. Leaders of “Daneco-CDA” group led by their spokesman ex-Congressman Manuel “Way Kurat” Zamora hotly contested the TRO in five-hour intense negotiations. The group reportedly forced their way to enter the office premises, breaking up the steel chains that tied the closed gates. Presence of police and military on guard outside the office compound was noted. Zamora and his counsel argued that the 60-day TRO could not be served by the lawyers but by the court sheriff. They also said that the TRO only prohibited the 9 directors from performing and it did not specifically state they had to make a takeover. Gov. Uy and Mayor Uy later arrived in the scene. The July 1 special general assembly was hailed by the “Daneco-CDA” group as the first of Daneco under a CDA regime when set of officers were swore in, and requirements for CDA registration were confirmed. There are least 8,000 member-consumers attending it, though opposing Daneco employees alleged that most of whom were barrio folks ferried thru hakot system. In evident reprisal, on July 4, the “Daneco-CDA” management put 57 employees under preventive suspension without pay for 30 days. On the next days, the suspended employees started encamping for a picket infront the Daneco office at Tipaz. On June 6, Gov. Uy, Energy Secretary Almendras and the late DILG Secretary Jessie Robredo reportedly met in Manila to try solving Daneco’s worsening conflict. On July 9 upon his return to his province Gov. Uy bared to the public that he and the secretaries agreed for the meantime that while there was a TRO the 9 dismissed directors and Hibionada would not hold office, and at the latter’s stead employee Reynaldo Bandala would have to be the OIC GM. He would work jointly with NEA Project Supervisor Estaca. Bandala is a protégé of Hibionada. On the same day, Uy then instructed Bandala to order for a return to work of the 57 employees whom Hibionada and company suspended without pay for thirty days. It was said that this interregnum had freed the P80 million on joint account with Estaca as co-signatory to pay for the power bill obligations to PSALM. NATCCO Partylist Rep. Paez in his privilege speech last September 3 bared that Daneco had pending P106-million obligations to PSALM and P34 million to the National Grid Corporation. “While the cooperative holds P160 million from its collections in May and in June, which is now in its new depository bank, EastWest Bank, it cannot dispense the fund properly as there is an interpleading case on who should be the signatory for bank transactions of the cooperative,” Paez said. Earlier, NEA Administrator Bueno specifically wrote the managers of the United Coconut Planters Bank and Rizal Commercial Banking Corporation, Daneco’s depository banks, authorizing Estaca to sign and countersign all checks and other banking transactions of Daneco. But just a few days when Bandala and Estaca were assumed to work jointly, on July 10 NEA administrator Bueno, who was visiting Daneco with DOE Undersecretary Ina Magpale Asirit, appointed Ongking as Daneco OIC GM, violating the reported agreement between Sec. Almendras and Gov. Uy. She also issued a memo terminating newly-hired job-order employees. But before Ongking could warm his seat at Daneco Tagum office, the “Daneco-CDA” group moved in and seized the control and management of the Daneco Tagum office with Bandala as its OIC GM. They vowed to bar Estaca and his agents from entering Daneco Tagum premises. On July 15 at the prodding of “Daneco-CDA” group some 300 people claiming to be member-consumers held a rally infront the tightly-guarded Daneco main office at Montevista. They wanted NEA to leave Daneco, declaring that Daneco is already under CDA. The protesters were however countered by Daneco employees praying rosary. Sketchy reports swirled that the “Daneco-CDA” group with their CISA guards was out to forcibly barge in the Montevista office but was held at bay by the “Daneco-NEA” group’s own guards and rosary-praying employees. Meantime, it was then when the Tagum employees returned to work that they shortly deserted to go to the “Daneco-NEA” management and worked for the separate collection of power bill payments from member-consumers. They made a good break as earlier they had been posing overt and covert internal resistance to their pro-CDA management in the areas of cash deposits, withdrawals, vaults and account signatories. As most regular employees of Daneco Tagum office left the pro-CDA management, the “Daneco-CDA” group was accused to have employed new job-order employees in what appeared as scabs-like employment. Later, the “Daneco-NEA” group secured a new legal victory at the CA when in a 15-page decision penned by Associate Justice Marilyn Lagura-Yap and issued last August 29, the CA granted the application for a writ of preliminary injunction. It added that the respondents also appointed Rey Bandala as Daneco’s OIC general manager, who collects payments from the member-consumers. “Whether true or not, this enforces the necessity for issuance of a WPI (writ of preliminary injunction). We cannot afford a scenario, that while the main case is pending, two contending factions will control Daneco,” the order read. “This will obviously be detrimental to Daneco as an institution and to its member-consumers,” Yap said in her ruling. However, the petitioners and the sheriff of the Regional Trial Court (RTC) Branch 3 in Nabunturan, Compostela Valley alleged that the injunction was not enforced since Bandala refused to heed the resolution as it did not specifically prohibit those acting for in behalf of the dismissed employees. Thus, the “Daneco-NEA” group asked the CA for a revised injunction. In a nine-page resolution promulgated on September 26 and signed by Associate Justices Marilyn B. Lagura-Yap, Edgardo A. Camello and Renato C. Francisco, the appellate court amended its previous resolution, which prohibited some members of the board of directors of the cooperative from performing their tasks, by including a certain Rey Bandala. In the previous resolution, it only stated that Bandala was appointed by the respondents as Daneco’s OIC general manager, who collects payments from the members-consumers. The CA ruled that the sheriff shall continue its authority to serve the second resolution issued by the CA that includes Bandala in the injunction. Meanwhile, in strange and separate turn of events, the NEA-designated OIC GM Ongking was shot but was unharmed last August 15 by still unidentified motorcycle-riding assailants in tandem while he was delivering his child to school in Tagum City. His driver sustained gunshot wound in his hand. The Tagum police is still clueless on the motive of Ongking’s shooting at press time. Earlier, Judge Clapis was dismissed from service for conducting bail hearings without petition for bail filed by an accused in a criminal case. In a 16-page decision promulgated on July 17, Supreme Court (SC) Senior Associate Justice Antonio Carpio and other 13 associate justices dismissed Judge Hilarion P. Clapis Jr. of Regional Trial Court (RTC) Branch 3 in Nabunturan, Compostela Valley for gross misconduct and gross ignorance of the law. As the two groups continue in their legal, management and collection tug-of-war, not a few member-consumers are asking which group will pay for the millions-worth power bill obligations of Daneco to PSALM and the National Grid Corporation due for the Tagum and Davao del Norte areas. Rural Urban News (RUN) is a blog-based community news and narrative reportage advocacy group promoting web-based citizen journalism. https://cha4t.wordpress.com. contact cp no. 09392218348. The board of directors of Davao del Norte Cooperative (Daneco) has chosen the option of having the vacancy of the regular general manager to be published again visibly finding former OIC GM Allan Laniba not fit to manage the multi-billionaire cooperative. The board in special session last December 18 sent its decision to the National Electrification Administration for the re-publication of the post than the acceptance of the Laniba to the post, two options that NEA recommendation earlier forwarded to the board. Under the law, the board of the power cooperative has the final say in the choosing of the general manager as it is mandated to confirm NEA’s recommended GM following series of validations, examinations, interviews and interviews of shortlisted applicants. The board first tackled the issue of whether confirming Laniba or not last December 11 and on that date moved to tackle it in a committee of the whole by Dec. 18. On the latter date the board met and finding the GMship issue as urgent and with all the directors present converted the committee of the whole into special session. NEA would still send its advisory on when the notice of vacancy of Daneco GM would be re-published by national and local newspapers. As this developed, board president Dean Briz has reportedly received death threats in his cellphone days after the board decided to re-publish the vacancy of Daneco GM. One text message says, “mapugos ang grupo sa pagpatay nimo”. Other text messages were reportedly sent to other management executives of Daneco threatening them to be cautious in making official Daneco documents as they might be included in a suit against Daneco board officials. Tagum City Councilor Mylene Baura has not yet withdrawn from her bid as she has yet to apply for the vacant position of general manager of the multi-billionaire Davao del Norte Electric Cooperative (Daneco), clarified City Councilor Reynaldo Salve in an ambush interview during a forced break of their session due to a sudden brownout Monday morning. Baura, a lawyer and certified public accountant (CPA), was earlier endorsed in a resolution filed at the City Council in last week’s session as more than qualified to be the next Daneco general manager following the death of GM Edgardo Savellano. She was present on Monday’s session but she went out from the session hall when the session resumed after about 10 minutes of power interruption. Salve said that inasmuch that the National Electrification Administration (NEA) or the Daneco Board of Directors has not yet declared the position vacant and “published it in a newspaper” nobody could yet apply for Daneco GM. Salve said that the the right process based on the bylaws is that first NEA would have first to receive applications from applicants for the GM and it (NEA) would have to select from among qualified applicants and endorse him or her to the Daneco Board which would also endorse its choice to NEA for confirmation. “The resolution of endorsement to Mylene is still referred to the committee on government organizations and nongovernment organizations,” Salve clarified in the heels of reports that Baura has withdrawn from her GM’s bid in favor of the current OIC GM Alan Laniba, who was endorsed the other Saturday by all of the present members of Daneco Board except member Dean Briz, the city budget officer and Mayor Rey Uy’s protege. “NEA has still many things to do in selecting who should head Daneco including doing BI (background investigation) on the applicants,” Salve said. The resolution endorsing Baura for Daneco GM in last week’s session had fueled speculations that Mayor Uy was pulling the strings in his plan of putting the electric cooperative that services most of Davao del Norte, all of Compostela Valley and the Island Garden City of Samal (Igacos) under the city’s program and direction. Daneco has over 120,000 member-consumers at present.